Rotimi Amaechi, director-general of President Muhammadu Buhari Campaign Organisation, has reportedly described Nigeria as hopeless, saying the only way for the country to make progress is for “everybody to be killed”. According to an audio released by Phrank Shaibu, an aide of Atiku Abubakar, presidential candidate of the Peoples Democratic Party (PDP) Amaechi, who is minister of transportation, said this in a conversation with some journalists. The minister was heard saying there would be a university in his village after the plans to build one in Daura, hometown of President Muhammadu Buhari in Katsina state, have been concluded. 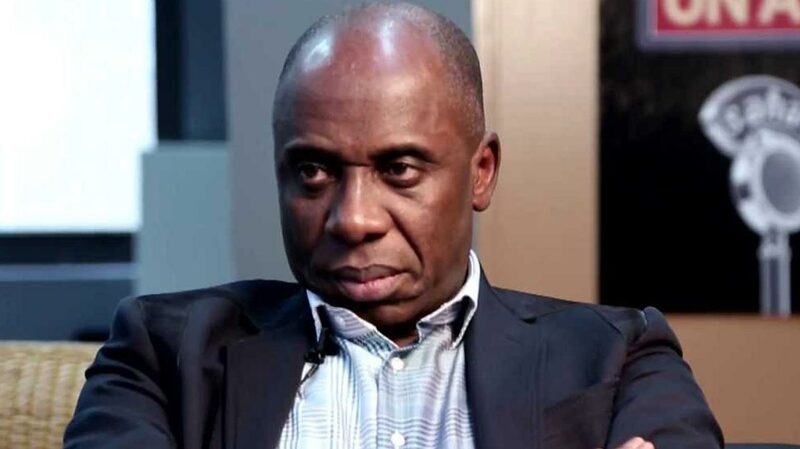 Amaechi is from Ubima in Ikwerre local government area of Rivers state. TheCable could not independently verify the audio. It is unclear when the conversation took place but it has been generating reactions on social media. David Iyiofor, spokesman of the minister, could not be reached for comments as of the time this report was filed. He neither answered calls nor responded to a text message sent. Commenting on the audio, Shaibu asked Nigerians to vote against Buhari in the forthcoming election. He said a vote for the president “is a vote for stagnation”, asking Buhari to “quit honourably instead of wasting tax payers monies on his reelection bid”. “The truth is that, the other day, the President confessed that the economy had collapsed under his watch. On another occasion , the wife confessed to the fact that, the canal and not her dearest husband, President Buhari was in charge of the country and now, the director-general of his re-election campaign has confessed to the lack of capacity of President Buhari and the dismal failure of hid administration,” he said in a statement.